The cooler weather has had me thinking about fall. Whether we want to admit it or not, August is almost a third of the way through and Labor Day is just around the corner. I like the summer, minus the July heat wave, but fall has always been my favorite season. Produce is at its peak, leaves change, and just enough chill enters the air. Too warm for a winter coat, but just perfect enough for a brightly colored scarf or light blanket. To me, fall is the perfect time for a stroll or hike in the woods, apple picking, or a long train ride to take in the foliage. With the new season brings new flavors too. Berries and fresh melon are traded for crisp apples and hearty butternut squash. And flavors of maple. I can remember grade school field trips, spent apple and pumpkin picking or learning how to tap maple trees to draw out their coveted syrup. It takes between 20 and 50 liters of maple sap to produce a single gallon of syrup. Until recently I used to think Grade A was the best syrup you could find. It was only last year, during a trip to Vermont that I learned Grade B was much darker and richer in maple flavor. My thought process made sense–you’d rather get an A in class over a B, right? But tasting them side by side, there was no debate. Sadly B seems to be much more difficult to find unless you head to the source. Here’s hoping I can track some down next month during our trip to the Adirondacks. But for now, I’ll take the purest syrup I can get. It was Nekisia’s recipe on Food52 that first inspired me to mix maple and olive oil. I’m always anxious of things getting too sweet. This combination was perfect, the olive oil distracting from the sweetness just enough. The first time I set out to make Nekisia’s recipe, I had hardly any of the right ingredients besides the maple syrup, olive oil and oats. I mixed a bit of this and that and produced some of the most amazing granola I’ve ever tasted. I, of course, forgot to measure and write everything down. A few attempts later, I believe I’ve finally found that perfect combination. Feel free to substitute your favorite nuts or other ingredients to make it your own. Preheat oven to 400°F. Mix all dry ingredients except coconut together in a large bowl. In a separate bowl whisk olive oil and maple syrup until emulsified. The mixture will become thick and sticky, like a batter. Pour syrup mixture over dry ingredients and mix well with a rubber spatula until evenly coated. 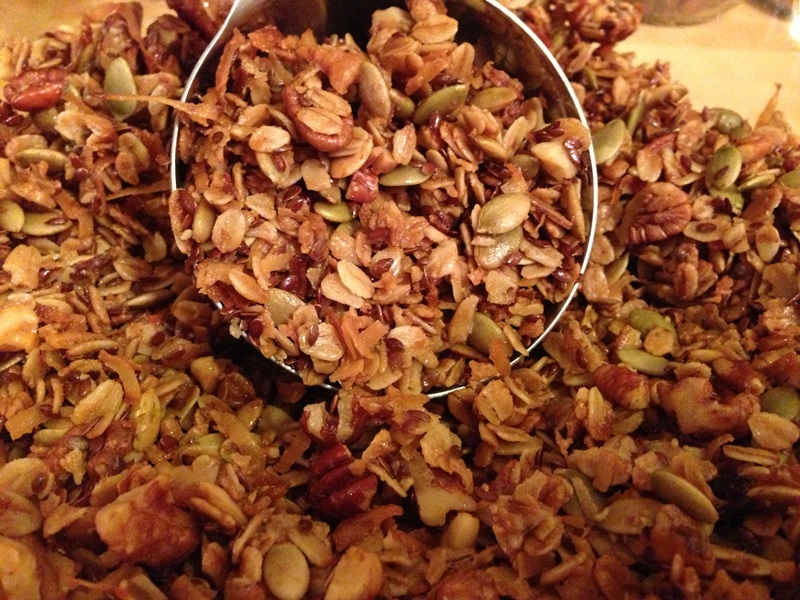 Spread onto parchment lined baking sheet and bake 45-50 minutes, stirring every 15 minutes until granola is toasted. Cool completely then stir in toasted coconut. Store in an airtight container for storage. Love the shout out — thank you! And great blog you’ve got going here as well! Hmm, peanut butter granola is a good option. This stuff is so simple and delicious I feel like you can eat bowlfuls without getting tired. I can do the same with peanut butter but need to take breaks because of the richness. I don’t necessarily want it to end, just stay coolish like it’s been. A summer in the low 80s is pretty perfect for me. No peach picking for us either, but not sure we’ll get to it this year. Thanks for the mention in related articles. Your recipe has me intrigued! I can’t wait to try it! You’re very welcome Kristin. Thanks so much for stopping by! I love the olive oil addition. Usually I use canola or if I’m feeling fancy some type of nut oil. This gives it an interesting twist. Love the fall and all the spices it brings along with it. This is a great granola! Thanks so much. Glad you enjoy! Yum! I too am a fall lover and have been meaning to get back on the make my own granola kick for a while. My husband LOVES granola and eats it like a bowl full of cereal. I never ate that much because it was so expensive, especially considering how much I was buying for him. When I realized how easy it is to make and how much cheaper, I discovered a new found love. Haha, we spend so much money on food but when something’s good and cheap, we go for it. Cheap is always a big plus in my book. I like granola with yogurt but my boyfriend does it with milk like your husband. Maybe it’s a guy thing? Personally, I prefer by the handful, but yogurt is almost as good. I love maple syrup in granola! I agree with you, grade B is my favorite too. I used coconut flakes in my last granola and loved the result – though I found that you don’t have to pre-toast it, as it toasts on its own while being baked with the other ingredients. So next time if you’d like, you can save yourself a step if you’d like 🙂 And because I love cinnamon, I think I’d add a teaspoon of it when I try out this recipe sometime. But if you don’t pre-toast the coconut, then you can’t eat any of it. 🙂 I’ll try skipping the step next time. I get into a habit because I often add the coconut after the bake, stirring it in with fruit and/or chocolate. Cinnamon would be a nice addition. I usually spice up my granola, but really liked the simplicity of this one. I use that recipe all the time, it’s wonderful!! I’m with you–fall is my favorite time of year, too. Love being able to comfortably wear layers and still hit up the local farmer’s market 🙂 This granola sounds absolutely delicious and PERFECT TIMING because guess who is in the middle of making a grocery list. BOOM! Thanks 🙂 Hope you enjoyed your SITS Day!!! Lol, thanks Charlotte. Don’t you love when that happens? Things that you want to do actually happen at a convenient time? So rare. Usually it’s oh I need to remember to make x, then go food shopping, then forget, then might get around to it 6 months later. Enjoy the recipe–let me know how it turns out!